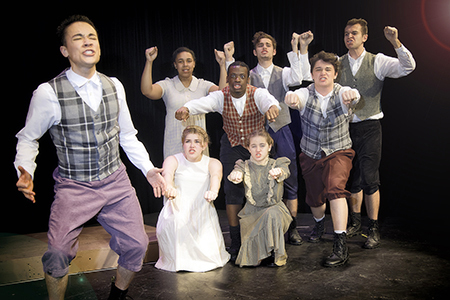 Pictured left is Marshall McGuire as Melchior, with Julia Toto, left kneeling, and Jackie Galli; middle row, from left, Donte Wilder and Liam Smith; and top row, from left, Karena Lewis, Tyler Fowler and Matthew Swanson. Photo by Robert Terrano. Julia Toto as Wendla and Marshall McGuire as Melchior. Photo by Robert Terrano. Lauren Suchenski and Donte Wilder. Photo by Robert Terrano. From left, Matthew Swanson, Marshall McGuire, Donte Wilder, Liam Smith and Tyler Fowler. Photo by Robert Terrano. 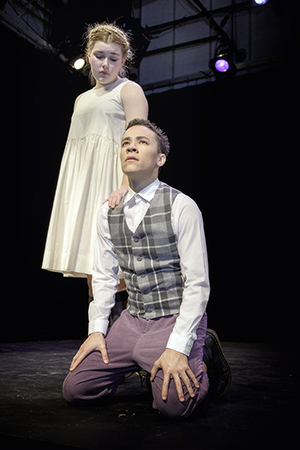 West Windsor, N.J. – The fraught and poignant passage from adolescence to adulthood takes center stage as the Theatre/Dance program at Mercer County Community College (MCCC) presents the groundbreaking musical “Spring Awakening.” This unforgettable coming-of-age tale comes to MCCC’s Kelsey Theatre Fridays, Apr. 6 and 13 at 8 p.m.; Saturdays, Apr. 7 and 14 at 8 p.m.; and Sundays, Apr. 8 and 15 at 2 p.m.
Their angst-ridden journey is set to the brilliant rock and roll score by Steven Sater and Duncan Sheik. The original Broadway production premiered in 2006 and was the winner of eight Tony Awards, including Best Musical. The show is based on the controversial play by Frank Wedekind, once banned in Germany. The adult roles will be played by Lauren Suchenski of Yardley, Pa., and Jim Morris of Plainsboro. The live orchestra will feature Conductor Scott Hornick, Coordinator of the MCCC Music Program, and Music students Joseph Suarez on bass, Jim Holton on cello, Kylan Hillman on guitar, Jillian Ashcraft on guitar/violin, and Sam Meerwarth on percussion, plus community member Laurie Gougher on piano and instructor Josh Wilson (piano swing). 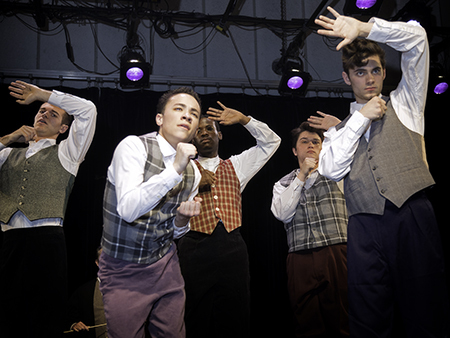 Tickets for “Spring Awakening” are $20 for adults, $18 for seniors, and $16 for students and children. Tickets may be purchased online or by calling the Kelsey Box Office at 609-570-3333. Kelsey Theatre is wheelchair accessible, with free parking next to the theater. For a complete listing of adult and children's events, visit the Kelsey website or call the box office for a brochure.